Frederick T. Zugibe, M. D., Ph. D.
Adjunct Associate Professor of Pathology, Columbia University, College of Physicians & Surgeons, N.Y.
Chief Medical Examiner, Rockland County, N.Y. There is no doubt that Dr. Pierre Barbet was a great pioneer in the field of crucifixion and Shroud research and made major contributions in attempting to collate the mechanisms of crucifixion with the findings on the Shroud. 1, 2 He is also one of the most widely quoted scientists in crucifixion research but unfortunately, these quotes from Barbet's studies are frequently misinterpreted as unqualified, proven facts instead of theories that require confirmation by valid scientific studies that might challenge the validity of his studies. Many medical articles have been written but are entirely speculative and devoid of experimental studies. Many scientists frequently forget that it is their duty, whenever possible, to provide experimental support for their hypotheses. Father Weyland, the noted religious sculptor, summed this up most aptly, "Conjectures and theories not backed up by realistic experiments have always left me cold." The man of the Shroud of Turin was nailed through an area of the wrist called Destot's Space and not through the palm of the hand. The missing thumb on the Shroud was due to injury to the median nerve by the passage of the nail. The man of the Shroud died of asphyxiation. It is the purpose of this paper to demonstrate that all three hypotheses of Barbet are, in fact, untenable. Unfortunately, THIS CANNOT BE TRUE because these four bones are located on the little finger (ulnar) side of the wrist not on the thumb (radial) side of the wrist as is depicted on the Shroud! LOOK AT THE HAND WOUND IMAGE ON THE SHROUD TO CONFIRM THIS! Fig. 1) Note that the hand wound image on the Shroud is indeed on the radial (thumb) side of the wrist. COULD BARBET HAVE JUST MADE AN ERROR IN NAMING THE BONES OF THE WRIST? The answer is NO! 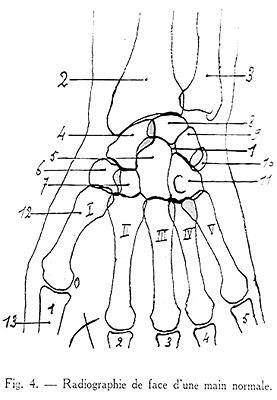 because of the following: first of all, IN BARBET'S 1937 book, 1 the diagram of DESTOT'S SPACE (Fig.2) unquestionably shows this space on the ulnar (little finger) side of the wrist and NOT on the radial (thumb) side of the wrist where the wound image is depicted on the Shroud. This is confirmed in any anatomy text book. 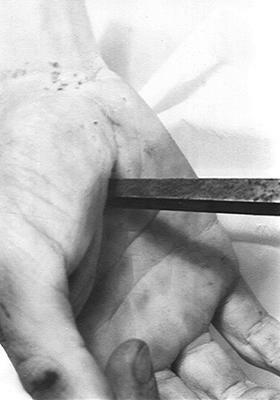 Secondly, in the same book there is a photograph of a cadaver that Barbet nailed to a cross which also shows that the nails are indeed nailed through the small finger (ulnar) side of the wrist and not on the thumb (radial) side (Fig. 3). Thirdly, Barbet requested that Villandre, the master sculptor, make a crucifix according to the "precise information" he had given him. This was accomplished to Barbet's complete satisfaction. 1, 2 Again note that the nail is in the small finger side of the wrist (Fig.4). BARBET CONTINUED HIS CONFUSION AND MADE ANOTHER SERIOUS ANATOMICAL ERROR. He said that when he drove the nail through Destot's Space, anywhere from 1/2 to 2/3 of the trunk of the median nerve was severed. This IS NOT anatomically possible because the median nerve is not present in the area of Destot's Space but instead runs along the wrist on the thumb (radial) side of the wrist and along the thenar furrow into the palm of the hand. An easy way to locate the median nerve on your own wrist is to bend your wrist forward. You will see a firm, rope-like structure jutting outward. This is the palmaris longus tendon which tells us that the median nerve runs along the thumb side of this tendon. Obviously, Barbet was damaging the ulnar nerve which runs in the area of Destot's space. WHERE THEN WOULD THE WOUND HAVE TO BE MADE TO BE CONSISTENT WITH THE SHROUD? Before answering this question, REMEMBER- the hand wound image is located on the back of the hand and only depicts the EXIT of the nail not its ENTRANCE. WE DON'T SPECIFICALLY KNOW WHERE THE NAIL ENTERED! Secondly, it can't be the center of the palm because it would not exit at the site of the wound image where the Shroud shows it nor could it support the weight of the body as determined by Barbet's experiments, and by mathematical calculations. Thirdly, it can't be the space between the radius and ulna because it wouldn't exit where the Shroud shows it. ONE: The thumb (radial) side of the wrist i.e. 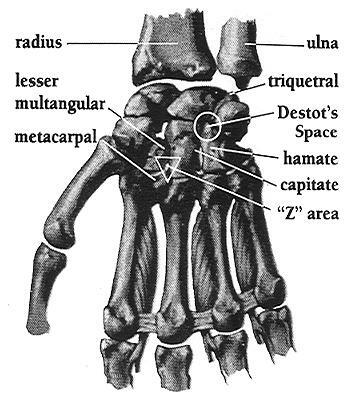 the area of the wrist opposite Destot's Area. The nail could pass through the radial (thumb) side of the wrist through a space created by four other carpal bones; the NAVICULAR, LUNATE, GREATER MULTANGULAR and CAPITATE bones, emerging where the Shroud depicts it. This is a very strong area and the trunk of the median nerve would most likely be damaged by this path. TWO: The upper part of the palm of the hand ... NOT THE MIDDLE OF THE PALM. This area is equally as sturdy as either Destot's Space or the radial area indicated above and would emerge at the site depicted on the Shroud. This area is located as follows; touch your thumb to the tip of your little finger. A deep furrow called the thenar furrow is seen at the base of the bulky prominence extending from the base of the thumb. This area was first pointed out by Monsignor Alfonso Paleotto, Archbishop of Bologna, who accompanied St. Charles Borromeo to Turin in 1598. It may be of interest that he postulated that the nail would have entered the upper part of the palm obliquely, and pointing toward the arm, it would have emerged where the Shroud depicts it. It is of interest that Barbet severely criticized Paleotto's hypothesis as "anatomically impossible." Monsignor Paleotto was indeed correct. If a nail is driven into this furrow, a few centimeters from where the furrow begins at the wrist, with the point of the nail angled at ten to fifteen degrees toward the wrist and slightly toward the thumb, there is a natural inclination of the nail to an area created by the METACARPAL bone of the index finger and the CAPITATE and LESSER MULTANGULAR bones of the wrist which we have coined the "Z" area (Fig. 5). I demonstrated this path over forty four years ago in the human anatomy dissection laboratory (Fig. 6,7). Last year, a striking unrehearsed event of monumental significance took place in the medical examiner's office that confirms the existence of this path. A young woman had been brutally stabbed over her whole body. I found a defense wound on her hand where she had raised her hand in an attempt to protect her face from the vicious onslaught. 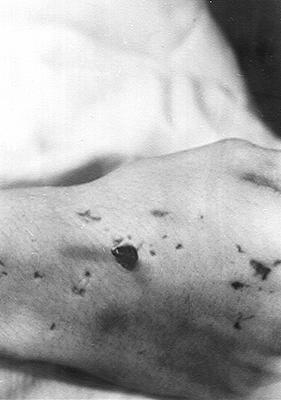 Examination of this wound in her hand revealed that she was stabbed in the thenar furrow in the palm of the hand; the knife had passed through the "Z" area and the point exited at the back of the wrist exactly where it is displayed on the Shroud (Fig. 8). X-rays of the area showed no evidence of broken bones! The palm region is the location most Christians across the centuries perceived the wound to be. The path through the upper palm is very strong and anatomically sound. The path ends exactly where the shroud shows the wound image. In the ancient literature, Lipsius and other authors and painters and sculptors related and depicted the hands that were transfixed in crucifixion. It assures that no bones are broken in accord with Exodus 12:46 and Numbers 9:12. 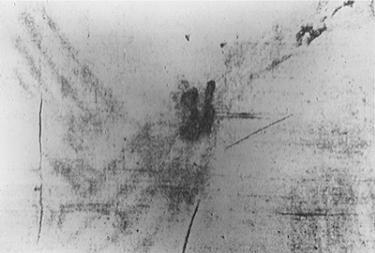 It explains the apparent lengthening of the fingers of the Turin Shroud because of nail compression at this area. Lastly, it is where most of the stigmatists( prior to Dr. Barbet’s book ) like St. Francis of Assisi, Padre Pio, Theresa of Konnersruth, St. Catherine of Sienna, Catherine of Ricci, Louise Lateau, etc. have displayed their wounds throughout the centuries. 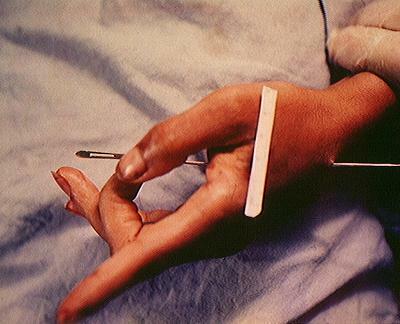 The missing thumb on the Shroud was due to injury to the median nerve by the passage of the nail. Barbet indicated that each time the nail was driven through Destot's space, the median nerve was severed either halfway or two-thirds of the way causing the thumb to be drawn into the palm. This of course is untenable because as we demonstrated above, the median nerve does not pass through Destot's space but runs along the opposite side (thumb or radial side) of the wrist. Even if the median nerve was injured causing, mechanical stimulation as Barbet claimed, this would still not cause the thumb to be drawn into the palm of the hand. Dr. Ernest Lampe, one of world's leading hand surgeons who in discussing injuries to the median nerve, relates in his book, Surgical Anatomy of the Hand, that in severance of the median nerve...... "THERE IS INABILITY TO FLEX THE THUMB, INDEX AND MIDDLE FINGERS". This was confirmed to me by several hand reconstruction surgeons. WHAT, THEN, WOULD ACCOUNT FOR THE MISSING THUMBS? There is, however, a very simple explanation as to why the thumbs are not visible on the Shroud. The thumbs are missing from the Shroud image because their natural position both in death and in the living person is in the front of and slightly to the side of the index finger. Therefore, it would be next to impossible to have impressions of the thumbs because the Shroud would not be in contact with them. You can demonstrate this by placing your arms and hands to your sides and noting that the thumbs normally reside in front of the index finger. Every day deceased individuals are brought into the Medical Examiners Office, many of whom are transferred to our office from the local hospitals. These usually arrive with their wrists crossed and tied together. In every case, the thumbs are hidden in a position in front of and slightly to the side of the index fingers. The first evidence was the bifurcation pattern corresponding to the image of the wound on the back of the hand. This was interpreted by Barbet as representing two positions assumed by Jesus on the cross in order to expire (breathe out). He postulated that Jesus was unable to expire in the lower position and had to push up with his feet in order to expel the air from his lungs. The interpretation of the bifurcation pattern is utterly absurd because this pattern is located on the back of the hand-not on the front. Why should that matter? Very simply, the back of the hand is pressed against the patibulum of the cross by the nailing. How in the world can you get a perfect double flow of blood? The heart is beating and is constantly extruding blood through the wound and I assure the reader that the hand is heavily endowed with blood vessels in vast networks constantly feeding from major blood vessels on both sides of the hand. This would create a large blood smudge with blood all over the hand, wrist and down the arm. This is supported by British Home Office Pathologist James Cameron, a forensic pathologist who indicated that a nail passing through the area of the median nerve would most likely hit a main artery. Every movement on the cross would result in episodes of oozing and over several hours there would be a substantial blood collection. Another important point that militates against the two positions causing a "double flow of blood" is the fact that the wrist does not change its angle even if the victim had to raise himself in order to breathe. The reason-The arms bend at the elbows and not at the wrists. We confirmed this during our suspension experiments described below. An additional consideration derives from the excruciating pain that would be experienced if the cruciarius attempted to raise himself by putting an amount of pressure equal to the weight of the body against the nails. Experiments to Test the Validity of the Asphyxiation Theory. The following experiments were designed with a view to determine whether the asphyxiation theory is tenable or not. A very sturdy cross was constructed for me by the late Father Weyland, S.V.D. with the stipes measuring 92" high and the patibulum measuring 3" wide and the base secured with reinforced angle iron. A series of numbered holes were drilled through each arm of the patibulum to allow for different arm lengths. This was necessary because the longer the arm length the closer to vertical the individual would hang if a single hole was provided for all arm lengths. Each hole was drilled in a slightly downward direction from front to back so that the bolts could be inserted from back to front in an upward direction to avoid slippage by special leather gauntlets used to secure the hands to the patibulum without constricting the wrists and compromising the blood supply. A hole was provided on each gauntlet at the level of the base of the middle fingers so it could be placed over the bolt that corresponded to the arm length of the volunteer. Human volunteers between the ages of 20 and 35 were given a physical examination and resting values were obtained which included, a 12 lead electrocardiogram, pulse rate, blood pressure, auscultatory examination, vital capacity and ear oximetry values, arterial blood gases, and venous blood chemistries. 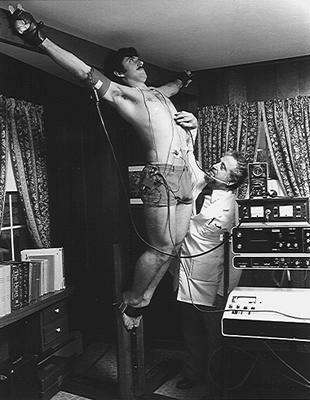 A gauntlet was firmly tied on each hand and heart monitoring electrodes were placed on their chests and attached to a stress testing apparatus (Fig.9) which monitored the electrical patterns of the heart, monitored the heart rate with digital readouts, and provided electrocardiogram strips automatically, each minute. A blood pressure cuff with double transducers was placed on the arm and attached to an Infrasonde electronic blood pressure unit (Fig. 9) and a Water's ear oximeter probe was attached to an ear and connected to an instrument that records the oxygen concentration of the blood at all times. Each volunteer was instructed to inform us of any breathing difficulties, pains of any kind, muscle cramps, or any other problems. They were also requested not to attempt to lift the body up at any time by straightening their legs. Each volunteer climbed up on a stool, placed their outstretched arms along the patibulum to line up the holes in the gauntlets with the respective holes on the patibulum corresponding to their arm length and bolts were inserted into the appropriate holes through the back of the patibulum then through the holes in the gauntlets. The stool was carefully removed allowing the volunteer to be fully suspended (Fig. 9). A modified seat belt was then utilized to secure the feet flush to the upright of the cross. An emergency crash cart containing a defibrillator, cardiac medications and intubation equipment was on hand to provide for the patients safety. Individuals were stationed to the right and left of the volunteers in case of an emergency. During the period of suspension, the following information was accrued and tabulated: visual inspection was made for muscle twitching, chest excursions, color, sweating, etc., and subjective information including pain, breathing problems psychological feelings, etc. were also recorded. A heart-lung evaluation including examination of heart and lungs with a stethoscope, periodic arterial blood gases, ear oximeter readings, vital capacity, electrocardiograms of specific leads, blood pressures, periodic blood chemistry screening including a routine chemistry screen, CPK with isoenzymes, lactic acid, etc. Douglas bag collections of the inspired and expired air were taken at various intervals. An experiment was performed on several of the volunteers who were requested to push themselves up with their feet as was indicated in Barbet's Asphyxiation Theory, in order to observe the angle of the wrist in both positions. Ten volunteers with angles of their arms with the upright between 60 to 65 degrees were studied by the above procedures but without strapping their feet to the cross with the seat belt device to determine if the feet support had any effect on breathing. The volunteers were suspended for periods ranging from 5 to 45 minutes determined by when they wished to come down. The major reasons for this decision was almost always due to the pain or cramping in the shoulders, arms and hands. The angle of the arms with the upright varied between individuals with a wide range from 60 to 70 degrees. There was no visual evidence of breathing difficulties throughout the suspension. Subjectively, every volunteer affirmed that they had absolutely no trouble breathing either during inspiration or expiration. A common complaint was a feeling of chest rigidity and leg cramps between 10 and 20 minutes into suspension. When this occurred, they were allowed to straighten their legs or come down. The oxygen content of the blood either increased or remained constant. Both visual observations and Douglas bag studies determined this to be the result of hyperventillation with abdominal breathing beginning after 4 minutes at a rate about 4-5 times normal. Sweating varying in amount from mild to marked occurred at about 6 minutes in most volunteers. The heart rate increased up to 120 at the end of their suspensions but there were no arrhythmias. There were occasional rapid rates as high as 175 but this decreased after the volunteer got over their initial anxiety. The blood pressure increased to varying degrees but never above 160 mm, systolic in everyone depending on their state of conditioning. The electrocardiogram only showed muscle tremors and no cardiac abnormalities. The backs of the volunteers never touched the cross except in the shoulder region of some volunteers where it was slight. Pain in the shoulders caused many of them to arch their bodies back so that the top of the head touched the stipes thereby relieving some of the pain . The Volunteers that were suspended without securing their feet had no difficulty breathing but suffered a marked increase in pain in their shoulders, arms and hands requiring the feet support or having to take them down. In order to arrive at the most probable cause of death, it is essential to examine the sequence of all the events from Gethsemani through Calvary; the severe mental anguish exhibited in the Garden of Gethsemani would cause some loss in blood volume both from sweating and hematidrosis and provoke marked weakness. The barbaric scourging that utilized a flagrum composed of leather tails containing metal weights or bone at the tip would cause penetration of the skin with trauma to the nerves, muscles and skin reducing the victim to an exhausted, wretched condition with shivering, severe sweating, frequent displays of seizures, and a craving for water. The results would cause a degree of traumatic (injury) shock and hypovolemia (fluid loss), the latter resulting from the sweating and the early stage of fluid accumulation around the lungs (pleural effusion) from the effects of the scourging. Animal experimentation by Daniels and Cate13 showed that blows to the chest in animals resulted in rupture of the air spaces in the lung (alveoli) and spasms of the air tubes (bronchi). Moreover the term "traumatic wet lung" refers to the accumulation of blood, fluid and mucous from severe trauma (injury) to the chest. The conclusion of traumatic shock from scourging, was also made by both Tenney14 and Primrose.15 The irritation of the trigeminal and greater occipital nerves of the scalp by the cap of thorns from the Syrian Christ Thorn plant, Zizziphus spina christi especially after he was struck several times with reeds would also contribute to traumatic shock. The bumpy, uphill road to Golgotha in the hot sun, with the crosspiece on the shoulder for a time, with falling some of the time, and being struck other times also added to the hypovolemia and traumatic shock. The progression of the pleural effusion would lead to increasing hypovolemia. 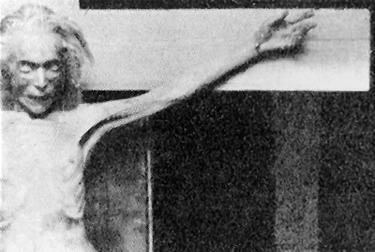 The large square iron nails driven through both hands into the cross would damage the sensory branches of the median nerve resulting in one of the most exquisite pains ever experienced by people and known medically as causalgia. The nails through the feet would also elicit a great deal of pain. Both of these would cause additional traumatic shock and hypovolemia. The hours on the cross, with pressure of the weight of the body on the nails through the hands and feet would cause episodes of excruciating agony every time the cruciarius moved. These episodes and the unrelenting pains of the chest wall from the scourging would greatly worsen the state of traumatic shock and the excessive sweating induced by the ongoing trauma and by the hot sun, would cause an increasing degree of hypovolemic shock. Destot's space does not conform to the hand image on the Shroud of Turin. The hand wound image on the Shroud, is on the radial (thumb) side of the wrist while Destot's space is on the ulnar (little finger) side of the Wrist. Moreover the trunk of the median nerve could not be severed if a nail passed through Destot's space because the median nerve is not present in the area of Destot's space but instead runs along the opposite side (radial) of the wrist in the thenar furrow into the Palm. The Shroud of Turin only shows the site of the nail's exit and not where the nail entered. There are only two possibilities as to where the nail entered: through the radial side of the wrist or through the upper part of the palm angled toward the wrist. The most plausible region for the nail entry site in the case of Jesus is the upper part of the palm since this area can easily support the weight of the body, assures no bones are broken, marks the location where most people believed it to be, accounts for where most of the stigmatists have displayed their wounds and it is where artists through the centuries have designated it and lastly it explains the apparent lengthening of the fingers of the hand because of nail compression. The missing thumb on the Shroud image was not due to injury to the median nerve by the passage of the nail. Injury to the median nerve would not cause permanent flexion (bending of thumb into palm). Moreover, the median nerve is not located in the area of Destot's space where Barbet drove his nails. The thumbs are missing from the Shroud image because the natural position both in death and in the living person is in front of and slightly to the side of the index finger. The asphyxiation theory is completely untenable. The cause of death in crucifixion is a consequence of shock. P. BARBET, Les Cinq Plaies du Christ, 2nd ed. Paris: Procure du Carmel de l'Action de Graces, 1937. P. BARBET, A Doctor at Calvary, New York: P.J. Kennedy & Sons 1955; Image Books, 1963. A. PALEOTTO, Esplicatione del Sacro Lenzuolo Ove Fu Involto il Signore, Bologna, 1599. E. W. Lampe, Surgical Anatomy of the Hand With Special Reference to Infections and Trauma, Ciba Clin. Symposia 9:3-46, 1957. 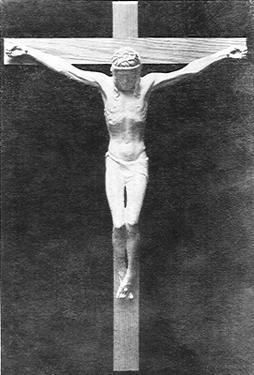 A. LEBEC, A Physiological Study of the Passion of Our- Lord Jesus Christ, The Catholic Medical Guardian, 1925. A. LEBEC, Le Supplice de la Croix, I'Evangile dans la vie, April, 1925. R.W. HYNEK, Science and the Holy Shroud, Chicago: Benedictine Press, 1936. R. W. HYNEK, LeMartyre du Christ, 1937. N. HAAS, Anthropological Observations on the Skeletal Remains from Givat ha Mivtar in Discoveries and Studies of Jerusalem 1970 Israel Exploration J.20:38-59, 1970. J. ZIAS and E. SEKELES, The Crucified Man from Giv'at ha-Mivtar, Israel Explor. J. 35: 22-27, 1985. R. GRAVES and J. PODRO, The Nazarene Gospel Restored, New York, Doubleday. SENECA, Ad Lucilius Epistulae morales. Epistle CL. R. A. JR. DANIELS and W. R .JR. CATE, Wet Lung-An Experimental Study, Ann. Surg. 172:836,1948. S. M.TENNEY, On Death by Crucifixion, Amer. Heart J. 68:286-287,1964. W.B. PRIMROSE, A Surgeon Looks at the Crucifixion, The Hibbert J. 47:382-388, 1949. S. L. ROBINS and R. S. COTRAN, Pathologic Basis of Disease, 2nd Edit. W.B. Saunders & Co. Phil. 1979, p. 112. S. L. ROBINS, R. S. COTRAN and V. KUMAR, Pathologic Basis of Disease, 3rd Edit. W B. Saunders & Co. Phil. 1984, p. 138. F. T. ZUGIBE, Death by Crucifixion, Can. Soc. For. Sci. J. 17:1-13, 1983.